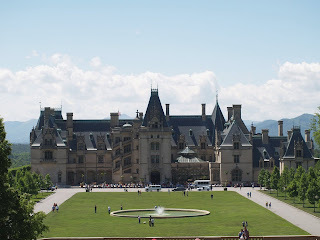 One of the items that kept me busy this past weekend was a trip on Saturday to The Biltmore Estate in Asheville, NC. Not too far of a drive for us and the weather was absolutely beautiful. I have to say that every time I go there I am in such awe of the beauty and size of the estate. This was our Mother’s Day gift to my MIL, and she simply loved it. We have been there twice before (two & seven years ago) both times right around Easter, so to see the flower gardens this time in full bloom was a wonderful treat. I would love to get up there for the Christmas season; it would have to be breath taking. The flowers and arrangements in and on the grounds are always spectacular. If you ever get the opportunity to visit, please do not hesitate. You will be rewarded with wonderful memories that will last a life time. I don’t think I could ever become tired of visiting either the house or the grounds. You can click on my Flickr banner (over there on the right hand side of the page under the little girl) and see some more photos. No pictures are allowed to be taken inside the house and yes, it is still furnished with all original artifacts. Isn't it wonderful? and Christmas is awesome. One year for Christmas I gave my in-laws and my parents season passes to the Biltmore House..and they went I think six times each (well, together on a few occasions!) They loved that gift.